How does holodeck keep people from running into the walls? I can understand how the holodeck creates virtual environments. But I don't see any mechanism that prevents people from walking into walls. Are the floors moving? Are they in a different dimension that has more space? Do they simulate the feeling of movement while keeping you stationary? Some simulations appear to take up far more physical space than the holodeck would allow (as in people are physically all over the virtually created world - like Voyager's 24/7 running Irish city). Matter conversion subsystem creates physical props using replicators. Replicated props are generally created when an object is likely to be touched by the participant. Some props are animated under computer control by precision-guided tractor beams. Holographic imagery subsystem creates three-dimensional images of simulated environments. Shaped forcebeams give physical substance to foreground objects so they have the illusion of being solid. 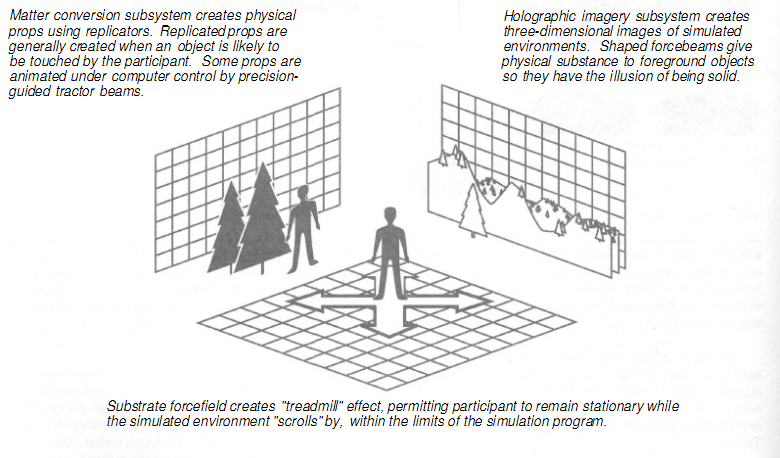 Substrate forcefield creates "treadmill" effect, permitting participant to remain stationary while the simulated environment "scrolls" by within the limits of the simulation program. With an omni-directional treadmill! They can already do that today! Not the answer you're looking for? Browse other questions tagged star-trek holodeck virtual-worlds . What are the size limitations of holodeck scenes? Why don't starships use holodecks as living quarters? How does the holodeck create the illusion of distance? How do Star Trek holodecks account for the spatial bias between multiple users? How did Star Trek characters detect being unconsciously tricked into a simulated Holodeck reality? Why can some holodeck matter leave the holodeck, while other holodeck matter (notably people) cannot? How many people can be in the same holodeck program at the same time? How did the snowball fly out of the holodeck? Why does Voyager keep running into the Kazon and Seska if it’s flying towards the Alpha Quadrant? How many people could fit inside a holodeck and not destroy the illusion? Does the holodeck safety limit change? What does Geordi see on the holodeck?